Synthetic peptide conjugated to KLH derived from within residues 100 - 200 of Mouse Emx1. This antibody gave a positive result in ELISA against the immunizing peptide (ab32995). IHC-P: 1/200. Perform heat mediated antigen retrieval before commencing with IHC staining protocol. Belongs to the EMX homeobox family. Emx1 expression in adult rat cerebellum, using ab32925 at 1/200 dilution. 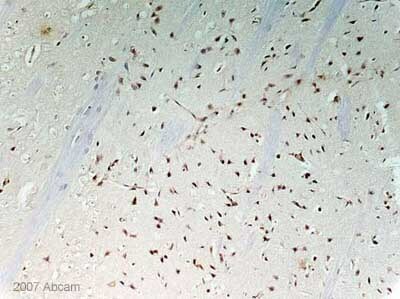 Emx1 expression in rat striatum, using ab32925 at 1/200 dilution. Emx1 staining of the rat primary motor cortex using ab32925 at 1/200. ab32925 has not yet been referenced specifically in any publications. Publishing research using ab32925? Please let us know so that we can cite the reference in this datasheet. Thank you for your enquiry and for your patience. 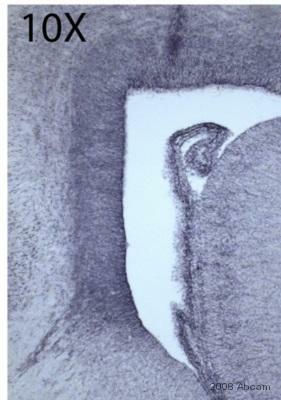 It has taken some time to discuss this with our source for this antibody. 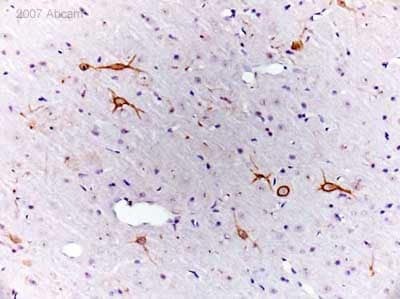 It is unfortunately difficult to say what the lighter brown staining is exactly in the IHC image provided for ab23340. A western blot with this tissue (human spermatophore epithelial cells) would have to be run to determine if any non-specific staining is there. As this protein (RAX) is a transcription factor, and this IHC image includes the nuclear stain, DAPI, the brown/blue staining is the specific signal here. 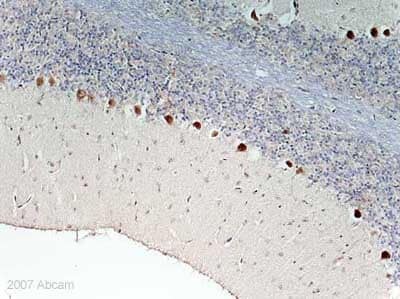 The lighter brown is cytosolic staining, which could be non specific. It may be the experiment required further optimization in this case and I am sorry we have no further information on this occasion as it has been tested externally. Regarding EMX1 antibodies, we have several available. However, I am sorry that regrettably non of these have been tested in IHC-Fr (cryosections). If you would like to test one of the non Fast Track antibodies in this untested application, please do not hestitate to contact me again prior to the purchase by replying to this message as you may be eligible for our testing discount program.